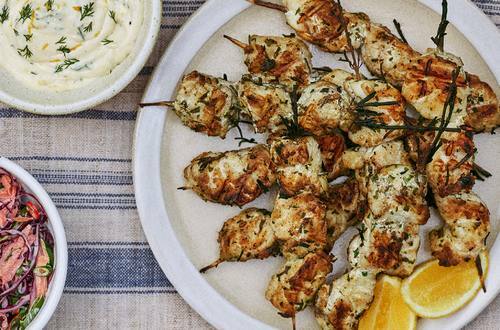 Kebabs are given a fresh new twist with this summer spectacular recipe from Hellmann’s. All hail the Monkfish Kebab. 1 Start by cubing two large fillets of monk fish. Sharpen the thicker end of a rosemary stem with a paring knife, or if available, buy a packet of bamboo skewers. 2 Marinate the cubes of monkfish in a bowl with olive oil, salt & pepper, garlic, and parsley. 3 In a bowl, mix Mayonnaise and lemon zest to create a delicious dip for later. 4 After fifteen minutes, thread the cubes onto the rosemary branch, and pop the skewers onto the barbecue, not for too long, as monkfish can cook quite quickly, even for fish. 5 Serve with the quinoa salad or the slaw from the vegan burger. Delightfully light, delightfully delicious.